this will be the last outfit for 2012! it´s my birthday today and it´s perfectly the right time to pond upon how my year was. i feel incredibly blessed by everything i have received, people i met, places i got to visit and the memories i am able to keep. like wine, it just gets better every year. so here´s me toasting to an equally (or more) amazing 2013! ein wunderschönes Outfit und eine wunderschöne Kulisse für die Fotos! Alles gute und ich hoffe, du kommst gut ins neue Jahr! I love your outfit! 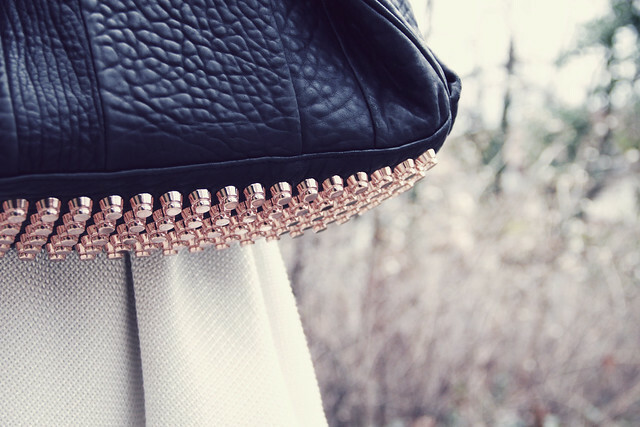 Especially the jacket and bag, love the rose gold studs. Beautiful, that dress is wonderful! happy birthday! I hope you had amazing day! happy birthday, gorgeous! have an amazing 2013! I wish you a very happy birthday! Love your dress! Und das Outfit ist toll! You look amazing, happy birthday beautiful! Happy birthday! You look gorgeous. Love that bag of yours! Happy new year, happy new everything!! Hey girls!! I'm selling some amazing ASOS, RIVER ISLAND AND TOPSHOP items on eBay!! check them out, they're out of stock on their sites!! Don't get me wrong, I absolutely love your blog, the way you look and the way you write, but sometimes you seem absolutely unaware of your proportions. Why does a petite beaty need to shorten herself with those boots and that length of a skirt? Just discovered your blog -- fantastic! Your looks are that wonderful but elusive combination of classic and edgy... just the inspiration i'm looking for! Sorry for being late: Happy Birthday! I wish you all the best!